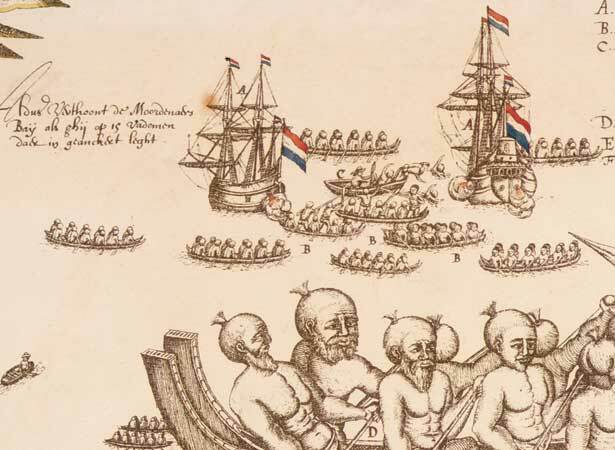 Abel Tasman’s Dutch East India Company expedition had the first known European contact with Māori. It did not go well. After Tasman first sighted New Zealand on 13 December, his two ships sailed up the West Coast. On the 18th they anchored north of what is now Abel Tasman National Park. The local inhabitants were Māori of Ngāti Tūmatakōkiri. Two waka paddled out to inspect the strange vessels. The Māori challenged the intruders with ritual incantations and pūkāea or pūtātara (trumpet) blasts, possibly to frighten away dangerous spirits. In response, the Dutch shouted and blew their own trumpets. They then fired a cannon, provoking an angry reaction. The next morning many waka came out to the Dutch ships. Four sailors were killed after a small boat was rammed by a waka. The Dutch ships then weighed anchor and sailed away. Tasman named the place Moordenaers’ (Murderers’) Bay. It is now called Golden Bay. It would be 127 years before the next recorded encounter between European and Māori, soon after James Cook’s arrival in New Zealand in 1769. We have 10 biographies, 2 articles, related to First known encounter between Māori and Europeans .